Due to popular demand, Craft Labs has decided to run a special program of analysis focusing on screening and identifcation of Saccharomyces cerevisiae var. diastaticus in brewery samples or wild isolates from your yeast wrangling projects! This program will bulk analyse samples, allowing us to offer a significant discount on this service (750 sek per sample)! More information coming soon on how to register samples and for the seminar! Saccharomyces cerevisiae var. diastaticus (or S. diastaticus) is an emerging beer spoilage yeast (both wild and domesticated strains) the ability to degrade complex carbohydrate that most common brewer’s yeast cannot. 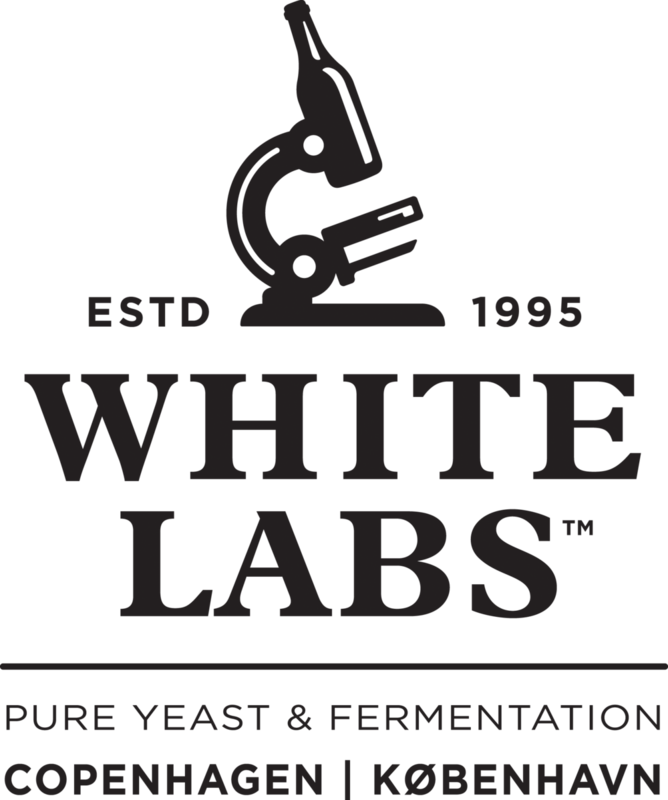 Several popular strains from yeast producers have recently been characterised as diastatic, including White Labs-565 (aka Belle Saison) and W-yeast French Saison (WY3711). We've compiled a list of all commerically available known and suspected diastatic strains! Click on the icon to get the table! Once the brewer’s yeast has done its job – this problem organism makes itself known by excreting an extracellular glucoamylase enzyme (STA1) that breakdowns residual dextrins and starches in the beer to fermentable sugars. The results can include altered beer flavor profile, increases in alcohol content, and if the beer has been packaged, it can become over-carbonation. The latter can result in ‘bottle bombs’ and ‘gushing’ when opened by consumers. These problems lead to product loss and recalls. The symptoms of a S. diastaticus contamination are not immediately obvious and can take weeks to months to manifest in packaged beers. The environmental conditions affecting the regulation of the gene encoding the offending glucoamylase enzyme (STA1) is not well understood. Furthermore, identifying these yeasts is difficult without molecular genetic techniques, most often limiting the ability of breweries to address these problems in-house. Two samples of the same beer. Sample on the left not demonstrating the symptoms of a diastaticus contamination, versus the one on the right which most definitely is. Both packaged and stored identically, and opened a minute apart. Saccharomyces cerevisiae var. diastaticus will be identified by detection of the STA1 gene using polymerase chain reaction (PCR) as per ASBC and MBAA recommendations. By performing analysis in bulk on a large number of samples we are able to offer big savings on this service with prices beginning at 750 sek per sample (~50% discount). Discounts on identifying yeasts down to species level with ITS sequecing will also be available. We will accept packaged samples (bottles/cans), samples shipped in sterile tubes, swabs, or single isolates on agar plates (available from us). Everyone loves a good seminar, and that's why we at Craft Labs are teaming up with Troels Prahl from White Labs Copenhagen (Head of Innovation and European Operations) to host seminar in Göteborg covering the biology, practical implications, and methods of idenfication for this troublesome spoilage organism. You'll also get the opportunity to pitch your questions at this yeast expert! Date to follow, but cost will be only 50 kr for those who have submitted a sample for analysis, and 150 sek for other attendees. A special media agar plate that contains only long chain carbohydrates that was inoculated (in spots) with a known Saccharomyces cerevisiae var. diastaticus strain. After a week of incubation, a dye that selectively stains long-chain carbohydrates is added to reveal where the they have been degraded! We can safely say that the plated yeast has a high degree of diastatic power! An agarose DNA gel of PCR products. 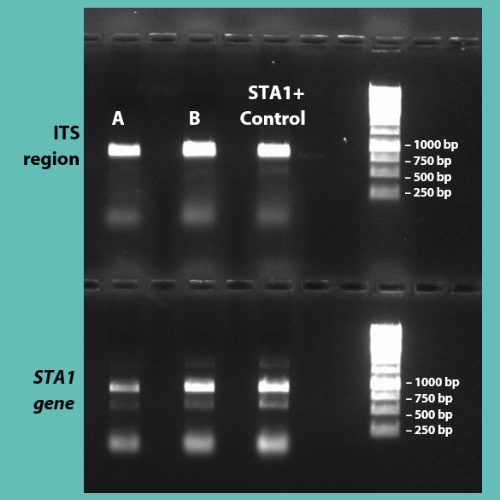 The top gel shows the presence of the ITS band of Saccharomyces cerevisiae (top), and the bottom, the STA1 gene. When the presence of both genes is detected for a sample (e.g. A or B), this indicates that it is Saccharomyces cerevisiae var. diastaticus! We always include a known diastaticus strain as a positive control (STA1+), just in case!